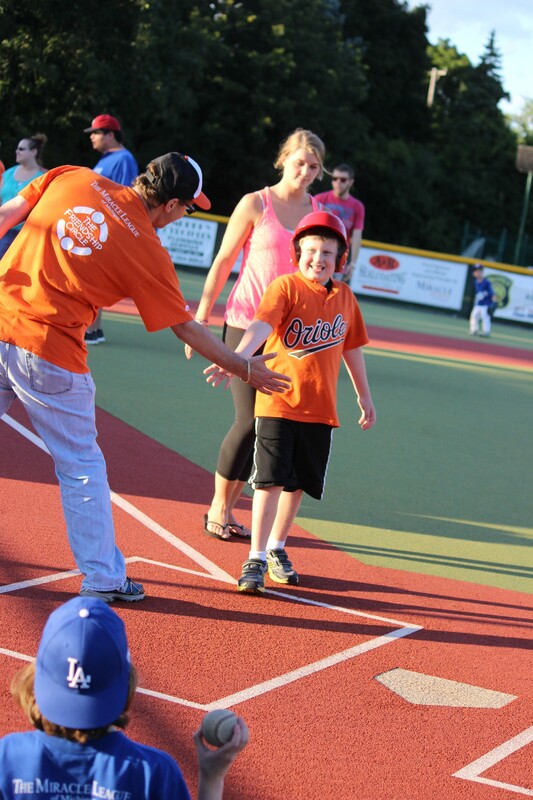 Over the last three months over 30 children with special needs participated in this summer’s Miracle League,. Participants were able to enjoy the thrill of playing baseball just like typically-developing children. In honor of this season’s Miracle League ending, we would like to present to you a visual story comprised of 15 special moments from Miracle League. Being a participant of Miracle League is a pretty big thing to be proud of. It’s not about the trophies-but we won’t deny that we love earning them. And Brendan certainly isn’t refusing his trophy as he poses with Coach Phil. Like Nicholas and Jodi, who enjoy spending quality time together. And working hard to be our very best. As we can see Lila here focusing before swinging her bat. It’s about keeping our eye on the ball, and knowing when to swing. Which is exactly what little Leila is doing. Miracle League is about teamwork and making it from base to base. See how Maryrose with volunteer Lisa are working together to make it Home? Reaching out for it like Josh is with volunteer Blake. With the same determination that Alex has. And getting the ball back to the pitcher when it’s time to. Travis does such a great job delivering the ball to the pitcher. When it’s in the heat of the game, we still communicate with our buddies. Just like Connor is with volunteer Hari. Miracle League is about the pride we have when we become a Home Run Hero. Look how proud Drew is! It’s about the instinct we get to run Home because we’re cutting it close. Watch how fast Jonathan is flying by! As Evan goes airborne to reach home plate! But at the end of the day, the best part of Miracle League is the Friendship! High-fiver Shoshana and volunteer Sanjana. But we still really do love getting those medals. Just like Miracle Medalist Arjun. This entry was posted in Programs and tagged Baseball, kids, Miracle League, special needs, Sports, sports league on August 15, 2014 by admin. Sunday February 2 (Superbowl Sunday) was not just an exciting day for football, but also a great day for basketball as well! We had our first day of Inclusion Sports Leagues in partnership with i9 Sports. This partnership is opening the doors for us to offer leagues to children with special needs like never before. The gym was packed all afternoon with neurotypical children and children with special needs aged 3 to 13 learning new skills, honing old skills and building friendships. WXYT-FM 97.1 talk show host Dan Leach provided play-by-play announcing at the inaugural game. The goal of this new league is to provide a mutually beneficial environment for both the typically-abled children and those with special needs. There really is huge benefit for both groups of children as the more typically-abled kids learn empathy, teamwork and other real life lessons. Those with special needs are gaining the opportunity to play sports on a team with their peers. The idea of this league is to promote inclusion and compassion. This entry was posted in Programs and tagged Basketball, Friendship Circle, i9 Sports, inclusion, leagues, programs, Sports, teams on February 3, 2014 by admin. For the 2014 Winter Session of Inclusions Sports, Friendship Circle is making exciting changes to our format. We are pleased to announce that we have partnered with i9 Sports. The partnership with i9 will allow Friendship Circle to offer leagues to children with special needs like never before. The teams will be inclusive of both typical kids and kids with special needs. All the children in the league will benefit both socially and emotionally by having the opportunity to be teammates. The typical kids will receive extra support from Friendship Circle on what to expect, why it’s so exciting to have a variety of teammates and how they can be great teammates. Our players with special needs will also receive additional support from Friendship Circle in the form of teen volunteers, and modifications to the drills and game play as needed. I9 Sports started in Tampa Florida and is the nation’s first and largest provider of youth sports leagues in the United States with over 600,000 members. The core principals of i9 fit right in with the value structure at Friendship Circle. I9 believes in fun, inclusivity, safety, good sportsmanship and allowing everyone to be a winner. The new sports leagues will run on Sundays. There will no longer be an Inclusion Sports League on Wednesdays. *After this date, any remaining spots will be filled on a first come, first served basis. The majority of kids in this division have never played basketball before. Defenses will enforce zone with specific spots for each child to play in (the visual aids really help the kids learn quickly). The teams will practice for about a 1/2 hour each week, and then have a game with real officials! As many kids here are still just beginning basketball, this division continues to emphasize ball handling skills, dribbling, and court awareness/spacing. Coaches focus more on passing and dribbling, as the kids are beginning to understand these concepts better. Defensively, we continue to enforce a zone with specific spots for each child. At this level, we do a lot more skill building. We have an instructional practice, where the coaches take the kids through some basic to advanced drills during the practice session. The refs will then come out and officiate the games. The teams will work on both man-to-man and zone defense, as well as improve their basketball related skills, such as shooting, passing, dribbling, and rebounding. This entry was posted in Big News, Programs and tagged Basketball, leagues, programs, Sports on December 16, 2013 by admin.